ABS-CBNPextalk359:All DAREd to Do What We've Done But Nothing Beats the ORIGINAL ONE! Award-winning actress Angel Locsin will reprise her role as the Pinay superheroine Darna, but this time, it will be on the big screen. This was confirmed by Star Cinema managing director Malou N. Santos in an interview with Manila Bulletin. Last year, ABS-CBN acquired the rights to several Mars Ravelo titles including Darna, Captain Barbell and Dyesebel. There are unconfirmed reports then about Angel Locsin reprising her role as Darna but it was not until today that the most-coveted 'stone' was confirmed to be bestowed still on Angel. Angel Locsin has played Darna for television way back in 2005. Then GMA-7 did another TV version in 2009 starring Marian Rivera. When ABS-CBN bought the rights to famous masterpieces of Mars Ravelo, the initial thought is that they will be remaking them for television. However, recent developments revealed that the management is planning for movie remakes of these works. According to Ms. Malous Santos, Star Cinema is already done with the script regarding Darna's past and currently brainstorming for the continuation of the story. The film outfit is targeting next year for the start of filming. So there you are. It's official that Angel Locsin will be playing Darna in a movie version by Star Cinema. Angel is very deserving for the role that even Marian Rivera (who already played Darna) approved of Angel's Darna reprise (read story here). Keep posted for more updates about this big Darna movie from Star Cinema and the rest of the cast, especially, the main villain Valentina and Darna's little brother Ding (the 'stone keeper'). Reigning Teen King and Queen Daniel Padilla and Kathryn Bernardo will be doing a movie remake of the hit fantasy-adventure Magic Temple, Star Cinema managing director Malou Santos confirmed. In an interview with Manila Bulletin, Malous Santos revealed that Star Cinema will be doing a remake of the 1996 film topbilled by then teen stars Jason Salcedo, Junell Hernando and Marc Solis. The said movie, directed by Peque Gallaga and Lore Reyes, is a big success at the 1996 Metro Manila Film festival winning all of the 7 nominations including Best Film. Malou Santos said that the Magic Temple movie remake topbilled by Kathryn and Daniel will be done in partnership with Reality Entertainment and will boast of new special effects. Star Cinema is also planning to make a movie franchise out of Magic Temple, the script of which is already on its first draft. "Were thinking of doing a franchise of Magic Temple na limang pelikula. Pag may may Magic Temple, magkakaroon ng Magic City, etc. So five stories na tuloy-tuloy," said Santos. Magic Temple then had a sequel, Magic Kingdom in 1997 courtesy of Viva Films and still directed by the tandem of Gallaga and Reyes. The film still starred Salcedo, Hernando but Solis was replaced by Janus del Prado. It was also the film debut of now multimedia princess Anne Curtis. Are you excited for the Magic Temple remake starring Kathryn and Daniel. Well, the movie will be released most probably late 2014 (maybe another MMFF entry). For now, let's savor the magic of KathNiel in Got to Believe, weeknights on ABS-CBN primetime bida. In the year 2300, the world faces constant threats of invasion from supernatural groups of werewolves, vampires and mermen. Nations build cities within fortified walls in their desperate effort to save the human race from extinction. But after reaching near collapse, the governments finally arrive in an ultimate solution: build an army of teenagers bionically enhanced with the power and abilities of their enemies. Every year, the Council of Nations picks 100 young people from the list of able-bodied prospects submitted by all member nations. Called "The Randoms", these teenagers, who are taken deliberately from their families, are put into vigorous trainings that will determine what supernatural group they're going to be part of. They are then placed under a transitional stage where they get treated with the supernatural blood, a process which might be fatal for most of them. Those who survived, undergo the last phase of their training and are sent straight to the battles to fight. kakaintriga ang thread title. Ibig sabihin ipapasabog sa kapamilyanovelas ang Marry Him If You Dare? Filipinos in the country and in the United States joined forces for the protection of the environment in ABS-CBNs five-city advocacy run One Run, One Philippines: Isang Bayan Para sa Kalikasan, on Sunday (October 6) with a total of 88,190 participants in its local legs. The One Run, One Philippines, which was held simultaneously in Quezon City, Bacolod, Cebu, Davao and Los Angeles, is part of ABS-CBN's two-day event Kwento ng Kasiyahan: The Grand Kapamilya Weekend to celebrate the 60th anniversary of Philippine television. Kapit Bisig Para sa Ilog Pasigs (KBPIP) 10.06.13 Run for the Pasig River, the Quezon City leg of One Run, One Philippines, crusaded and clamored again for Pasig River rehabilitation and cleaner esteros in Metro Manila with 79,000 participants. The participants of the 10.06.13 Run for the Pasig River in 3k and 5k categories started at 6 AM at the Technohub in Philcoa going to Commonwealth Avenue, then finished at the Elliptical Road of Quezon Memorial Circle (QMC). Among the runners were Quezon City Mayor Herbert Bautista, ABS-CBN Foundation managing director Gina Lopez, ABS-CBN News and Current Affairs head Ging Reyes, broadcasters Noli de Castro and Korina Sanchez, and Kapamiya stars Anne Curtis and Xian Lim, Kim Chiu. The crowd stayed until the post-race program that featured live performances of 6 Cyclemind, Itchyworms, Rivermaya, and The Voice of the Philippines Klarisse de Guzman and Mitoy Yonting, while some of the runners toured at other areas of QMC where booths of ABS-CBN programs were installed to offer different activities, treats and public service. KBPIP has organized four successful runs for the Pasig River and had raised P25.94 million since 2009 that helped raise awareness and fund part of the rehabilitation of the esteros in Metro Manila that leads to the Pasig River. The historic 10.10.10 Run for the Pasig River still holds the Guinness World Record for the most number of participants in a running event with 116,086 runners. Meanwhile, funds raised from four other legs of One Run, One Philippines will aid various environmental projects. The three provincial legs all started at 4:30 AM with its 21K category followed by the 5K and 10 K at 5:30 AM. These runs were led by Kapamilya stars Joem Bascon, Paul Jake Castillo, and Bangs Garcia in Bacolod, Paulo Avelino and Jayson Abalos in Cebu, Maja Salvador, and Aaron Villaflor and Bryan Termulo in Davao. The Bacolod leg, which will benefit the mangrove and livelihood projects in Punta Taytay, Sum-ag River rehabilitation, and ecotourism projects in Bacolod City Water District Campuestuhan Watershed was attended by 2,960 participants. In Cebu, 3,500 run for the coastal conservation in Daan Paz, while 3,000 runners supported the ecotourism projects in Marilog Tourist Center. Hundreds of Filipinos in the US, along with hunk actor Jake Cuenca, also took part in the Los Angeles leg held at Burbank, California, which will fund the projects of Bantay Kalikasans Green Initiative. Burbank Mayor Emily Luddy showed her support in the advocacy by joining in the event. Thank you for reading this post! If you like this post, please share it on Facebook, Twitter or Google+. If you have something to say - comments, suggestions, reactions, don't hesitate to post a comment below. Good day! HAVEY: Kausap namin ang maituturing na beauty queen-maker ng bansa na si Jonas Gaffud at sinabi niya na busy sila ngayon ni Cory Quirino sa paghahanda para sa pagbabalik ng Miss World 2013 na si Megan Young. Darating daw sa bansa si Megan sa Huwebes (October 10) nang 4:00 PM at inaasahang ang mga press mula sa Kapamilya, Kapuso at Kapatid networks ay sasalubong sa kanya. Maging ang mga print at other media organizations ay welcome sa pagbabalik sa bansa ni Megan Young. Kinabukasan (October 11, Biyernes), ipaparada si Megan sa Ayala, Cubao at sa kabuuan ng Metro Manila para sa kanyang grand homecoming. Ang biro ni Jonas ay puwede itong tawaging MILLION BEKI MARCH bilang alternative spin sa nakaraang pagkilos against the pork barrel issue. May nagsabi rin na ito ay BLUE FRIDAY dahil blue confetti ang isasaboy para sa Miss World, na bughaw ang korona. Nire-request ang mga manonood ng parada na magsuot ng asul bilang pagpupugay kay Megan. Nang tanungin namin si Jonas kung ano ang pinagkakaabalahan ni Megan ngayon, ang sabi niya ay puro familiarization pa lang sa kanyang bagong environment ang ginagawa ni Megan. She had social functions din na dinaluhan at nagpa-interview na sa ibat ibang international media organizations like the British Broadcasting Company. Megan also had the time of her life when she tried the famous London Eye. Nakapanood na rin siya ng Wicked. She reportedly shopped na for her winter clothes, too. Sa pagbabalik ni Megan, aside from the press conferences, nakatakda rin siyang magkaroon ng homecoming sa mga kababayan niya sa Olongapo. She is also set to receive a Congressional citation from the House of Representatives and is looking forward sa kanyang outreach program sa Philippine General Hospital bago siya bumalik sa London -- kung saan siya mamamalagi for her entire year-long reign. Kasama ba si Mikael Daez sa plano ni Megan? Tahimik si Jonas at walang sinabi tungkol sa dati niyang alaga. WALEY: Kasabay ni Megan na nag-train under Aces and Queens ni Jonas Gaffud ang ating pambato sa Miss Universe na si Ara Arida. Pangarap ni Jonas na i-institutionalize ang kanyang training school for beauty pageant contestants at simulan ang pagbabago sa pamamalakad ng beauty contests lalo na sa mga probinsya thru what he calls a beauty caravan. After 13 years sa pageant training, gusto ni Jonas magtatag ng kanyang sariling international beauty contest. But while he persues his dream of establishing a pageant, busy si Jonas sa paghahanda para sa paglipad at pag-compete ni Ara sa Miss Universe pageant sa Russia. Matatandaang si Jonas din ang nag-train kina Venus Raj, Shamcey Supsup at Janine Tugonon na runner-up sa Miss Universe. Ngayong taon, ano ang chances ni Ara? Malaki, sabi ni Jonas. Im aware na marami ang mga nagsasabing mahina ang communication skills ni Ara pero positive ako na she will do well in Miss Universe dahil hindi naman siya bobo. Ano ang edge ni Ara? Her beauty. Im sure that her beauty will be taked about and will be more celebrated in Russia, paninigurado ni Jonas. Medyo masama ang loob ni Jonas na parang nanay na ng beauty contestants kapag may naririnig siyang malulupit na comments against Ara. Meron akong nabalitaang Oust-Ara movement ng ilang mga careless at mapusok na mga kababayan natin na nagsasabing sana ay mabangga ang kotse at maaksidente si Ara at mapilayan para mapalitan siya bilang representative natin sa Miss Universe. Well said, Jonas Gaffud. Sana nga ay waley nang mga naninirang ganito. At ingatan din sana ang pagda-drive at paghahatid-sundo mo kay Ara, Ervic Vijandre, ha?! Actor Paulo Avelino will finally be working with actress Angel Locsin for the first time on an episode for ABS-CBN's top-rating drama anthology "Maalaala Mo Kaya." Avelino is doing an "MMK" episode with Locsin after reports surfaced that he allegedly refused to work with the actress. The "Walang Hanggan" actor had backed out of Locsin's upcoming series which has the working title "Hanggang Kailan Kita Mamahalin," which they were supposed to headline. But in a previous interview, Locsin said she understands that Avelino has an important personal matter to attend to. Sinabi sa akin na hindi nga daw matutuloy. May common friend kami na nag-explain na mayroon yatang personal problem si Paulo na kailangan niya i-prioritize. Hindi ko alam kung nai-share niya sa inyo, pero 'yun lang ang masasabi ko. Naiintindihan ko naman iyon, kailangan niya talaga unahin 'yun, she said. Also part of the upcoming series are Maja Salvador and Jericho Rosales. In her official Twitter account on Monday, Locsin confirmed that she's now taping "MMK" with Avelino. hindi kaya sa wansa yang honesto? parang alamat ng pinya lang ang dating. For the first time, Sunshine Cruz shared in detail how she and her erstwhile estranged cousin Sheryl Cruz patched things up and put their misunderstanding behind them. Speaking to reporters on Tuesday, Sunshine said it happened during a meeting for the Kapamilya series Galema, which stars both actresses. Sunshine recalled nervously approaching Sheryl and started talking to her about what went wrong with their relationship. Sabi ko, Ate Sheryl, I just want to ask kung bakit ka nagalit sa akin. Sabi ko nga, bakit ba siya nagalit sa akin, never naman ako nagsalita ng anything bad against her. Tapos sabi niya, Si Geneva (Cruz) ka-close mo. Si Gen yata 'yung nagsalita noon. Sabi ko, Si Gen lang iyon, hindi ako, she shared. Sunshine said this then paved the way for a heartfelt conversation between them which ended with a hug. Sabi niya, Nadamay ka lang kasi close kayo ni Geneva. Nag-sorry ako sa kanya kung ano man [ang nagawa ko], tapos nag-sorry din siya sa akin tapos nag-hug kami, and then okay na, Sunshine said. It has been more than a decade since Sunshine and their other cousin, Geneva, allegedly lambasted Sheryl for not paying her last respects to her father Ricky Belmonte in 2001. Now that things have already ironed out between her and Sheryl, Sunshine said she made an effort to talk to Geneva and tell her about what happened. And si Gen naman, willing naman siya. Sabi niya one of these days dadalaw daw siya sa set namin para mag-sorry kay Ate Sheryl, she said. Noting that they are no longer getting any younger, Sunshine said its about time that they have each others backs because blood is still thicker than water. Ang pangit naman kung hanggang ngayon nag-aaway pa rin. Dapat nagdadamayan kapag magkakamag-anak, hindi nag-aaway, she said. In a past interview, Sheryl said she is enjoying every minute of working with Sunshine after not talking to each other for years. "I am actually very excited how she flourished as an actress and despite sa pinagdadaanan niya ngayon in her personal life, hanga ako sa pinsan ko kasi she's a good mother to three daughters at best interest ng children 'yun ang kanyang iniisip," Sheryl added. Like Sunshine, Sheryl is also separated from the father of her daugher, Ashley. PAGLABAS NI ANDI SA GALEMA, TINUTUKAN NG BUONG BAYAN! 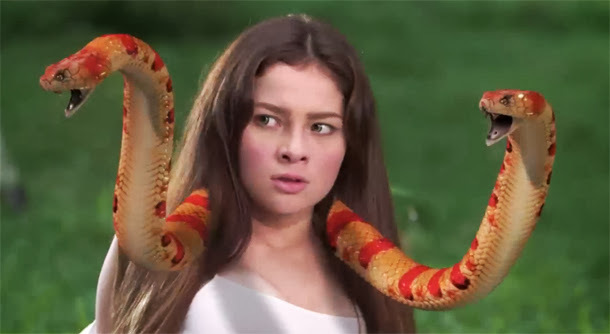 Pumalo sa pinakamataas nitong TV ratings ang hit afternoon teleserye sa ABS-CBN na Galema: Anak Ni Zuma noong Biyernes (Oktubre 4), kung kailan lumabas si Andi Eigenmann bilang ang dalagang may kambal na ahas sa balikat na si Galema. Base sa datos mula sa Kantar Media, humataw ng 20% national TV ratings ang Galema o lampas doble ng nakuhang 8.7% ng katapat nitong serye sa GMA na Pyra Babaeng Apoy. Inaasahang mas mahuhumaling pa ang mga manonood sa mga susunod na tagpo sa programa lalo nat muling magkukrus ang landas ni Galema (Andi) at ng tunay niyang ina na si Galela (Sheryl Cruz). Kakayanin bang tanggapin ni Galela ang bunga ng panghahalay sa kanya ni Zuma (Derick Hubalde)? 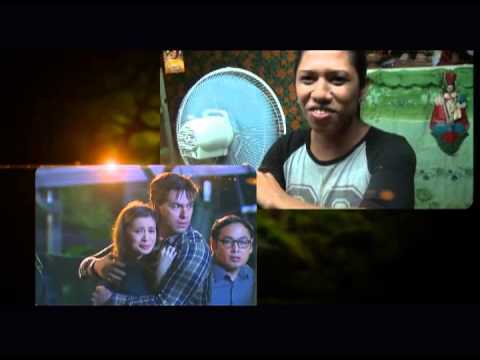 Patuloy na tuklasin ang naiibang kamandag ni Galema: Anak ni Zuma, tuwing hapon pagkatapos ng Kapamilya Blockbusters sa Kapamilya Gold ng ABS-CBN. Para sa karagdagang impormasyon, bisitahin lamang ang social networking sites ng programa sa Facebook.com/galemaofficial at Twitter.com/galemaofficial.